The only footsteps of Jewish settlement in medieval Krakow are entries in city books, small archaeological finds, as well as reminiscences in Christian art of the 14th and 15th centuries. There is no trace left of it in the urban landscape. Jewish homes were taken over by new owners, the synagogues and other community buildings were demolished or transformed to such a degree as to make identification impossible, cemeteries were levelled and built over. 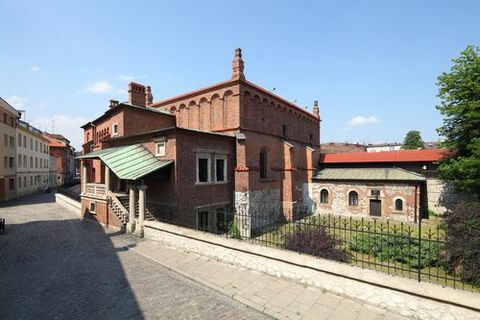 The situation is completely different in Kazimierz, where an urban complex of the former Jewish settlement that existed there from the end of the 15th century until the beginning of the 19th century, unique on a global scale, was preserved. The most important elements of this complex are the historical Old, New (Remuh) with the adjacent cemetery, High, Popper, Izaak and Kupa synagogues. A special place among the most valuable Jewish monuments belongs to the Old Synagogue, build ca. the mid–1480s by Jews leaving Krakow, which was inhospitable to them at the time. It is the latest-built and the easternmost of all the two-nave synagogues built in the Middle Ages in Europe. The Gothic pedigree of the Old Synagogue is a kind of link between Krakow Jews and the oldest Ashkenazi centres in Central Europe. Since its inception, until the outbreak of World War II, it continually played the role of the main synagogue of the community. It was the centre of religious and social life of the community, around which the spiritual power of the rabbis and the secular power of the qahal elders was focused. When it ceased to serve as a house of prayer after the tragedy of the Holocaust, it was assigned a new function: it became the seat of the Jewish museum, preserving the memory of centuries of rich Jewish history and culture in Krakow. All of this makes the Old Synagogue not only the most valuable monument of Jewish sacral architecture, but also the cradle and bastion of traditional culture of Krakow Jews. It is also a good place for a museum exhibit about itself, named aptly for the subject it touches on, The Bastion of Tradition.